The decrepit old visitor center at Stonehenge has been too small and too old for decades. In fact, it's been described with typical Brit candor as "disgraceful" and an "embarrassment" to England. Finally, this month, a new, $44 million visitors' center has opened—here's a look inside. A lot has changed at Stonehenge since the 1970s, when neo-pagans and hippies regularly held festivals beneath the massive stone arches. 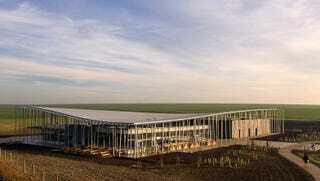 Today, Stonehenge is a tightly controlled site, where sensitive archaeological work is still being carried out. Another big problem at the site was one posed by contemporary development: Increasing traffic on a nearby road, the A344, was beginning to seriously threaten the site, according to a 2006 National Geographic survey. The project was approved in 2009, amidst deep cuts to other public projects—Stonehenge, it seems, gets a pass in times of austerity. And despite a number of delays, the work has gone ahead—the A344 was removed and grassed over this summer, and the construction of the new center finished up this fall, with an official opening in December. Construction workers on the roof of the new visitors center (top) and the former road, the A344, that was grassed over as part of the project (bottom). Images: Matt Cardy/Getty Images. The building, which sits roughly 1.5 miles away from Stonehenge, was designed by Denton Corker Marshall—which went to great lengths to references its much older prehistoric neighbor in the design. An undulating steel and zinc roof, held up by some 200 thin and slightly crooked columns, gives the building an ancient, organic vibe. Inside, three individual spaces for education and visitor services are covered in irregular wooden slats and more zinc.